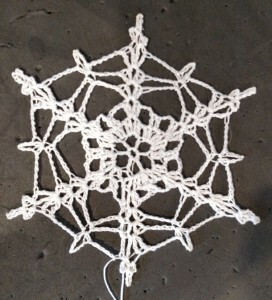 I did make a snowflake yesterday, except after I got home, I sort of fell into the knitting of miles of stockinette on teeny tiny needles until I was starting to fall asleep, and I forgot to update. Oops. Look, more clusters! A friend pointed out that clusters are the nupps of crochet, except that clusters are a LOT more fun and require far less swearing than nupps do. 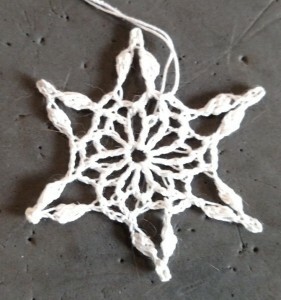 Which doesn’t mean anything to anyone, I realize, who isn’t a knitter, so just smile and nod, and let’s move on to today’s snowflake, shall we? This one was kind of fun to knit, plus it has the added bonus of sort of looking a bit like a spider web, if spider webs came with poky bits around the edges. I do not recall which book by Mary Roach I read first, but I loved it so much I immediately checked out every single thing I could find by her from the library and devoured them all as soon as they came in. So when recently I discovered that there was not one, but *two* of her books I hadn’t yet read, I immediately scurried to the library website, and put in the request. I just finished Packing for Mars: The Curious Science of Live in the Void, which is all about the science behind sending humans into space; not the building of rockets and such, but dealing with the human part of the equation – how do astronauts eat? How do they drink? How do they poop? It is, by the way, worth reading the book for just the chapter on pooping in space alone. She does her research, and presents it in her dry humor, and really makes the case for why sending humans into space (especially when considering longer voyages, like sending humans to Mars) is so very, very complicated. I’m working my way through Gulp: Adventures on the Alimentary Canal right now, reading a chapter here and there when I get the time to take an actual break for lunch at work, and am enjoying it greatly. Only a writer of her caliber can make entire chapters on things like spit and feces so delightful. Seriously, if you haven’t read any of her books, you really need to remedy that immediately.